The Higher Education Policy Institute (HEPI) is publishing a report on the past, present and future of students’ unions in the UK. Released just before the new academic year begins, the report traces the history of student representation in higher education to show its role in higher education debates. 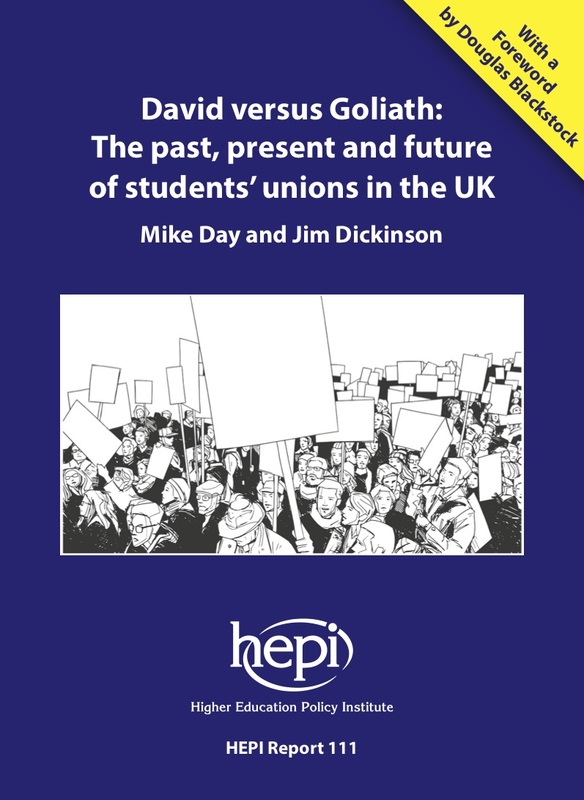 David versus Goliath: The past, present and future of students’ unions in the UK by Mike Day and Jim Dickinson, includes a Foreword written by Douglas Blackstock, Chief Executive of the Quality Assurance Agency. The report digs into the origins of students’ unions and summarises their role and history through the major higher education debates of the past century. It covers student rights, in loco parentis, massification, marketisation, freedom of speech and the co-production of educational outcomes. It also reflects on emerging practice in students’ unions in relation to innovation in student-led activity. Student representation has a much longer history in Scotland than in England – students have had a voice in Scottish universities since the fifteenth century, the antecedents of today’s students’ unions were founded in Scotland from 1737 and the UK’s first Student Representative Council was founded in Edinburgh in 1884, whereas universities in England were not legally obliged to have a student association until 1965. The nature of the relationship between students and their universities has long been the subject of debate – post-war students’ union officers were older than average and in many cases had been in command of men in battle, so rules covering male and female visitors, visits to ‘town’, cleaning rotas and compulsory games led students to challenge the concept of college authorities acting in loco parentis (on behalf of parents) as early as the 1940s. The legal concept of student consumer rights happened almost by accident after the NUS petitioned the old Office of Fair Trading over the link between non-academic debt (such as debts to a university library) and restrictions on obtaining a degree. Having piqued their interest, the Competition and Markets Authority then carried out a wider review whose terms of reference resolved to look at multiple aspects of the legal relationship between students and universities as service providers. Students’ union activities to be the subject of access and participation planning. The authors argue that if wider activities are a central feature of the benefits of UK higher education it cannot be right that we know little about differential recruitment and retention in them. Students’ unions should develop a deeper understanding of friendship at university and its impact upon success rates, drop-out figures and graduate employment – identifying students who miss out and creating activities programmes and interventions to close the gaps. Students’ unions should consider their research strategy to become more authentically representative, seeking to engage the breadth of student demography in formative discussions about their lives, their interests and the student experience with a focus on understanding what leads to positive or negative outcomes. Students’ union advice centres should embrace the student protections and rights agenda by clarifying and promoting new rights emerging from consumer law, supporting students to make complaints where justified. Universities and students’ unions should collaborate on a student employment strategy to improve the range, quality and pay of part-time work opportunities taken up by students – offering employment on campus, exemplar recruitment and selection practices and enabling students to boost employability from their experience. Sector bodies and the Government are also encouraged to value students’ unions and focus on the steps they might take to enable their development and innovation. We know little about students’ unions in the UK. Almost every university has one, but there is a dearth of research or reliable data on their form, their role or their successes. Their contribution to civil society, business and, crucially, the higher education sector is poorly understood. This report aims to tell their story and argues that they represent a jewel in the crown of UK higher education – central to its character and its long-term development. When students’ unions are discussed, they often face criticism – that they are not radical any more or those that are radical are unrepresentative and wasteful of resources. They can be branded as unhelpfully and unrepresentatively left-wing and socially (il)liberal, and others argue that they have been fatally incorporated, acting as dealers in the marketisation of higher education. Yet the UK higher education sector has some of the most effective and innovative student organisations in the world and, if we nurture them and enable them to develop and succeed, the benefits will be huge. There is a tendency to judge students’ unions through student politics, but there is a richer history to students’ unions that deserves to be told. This report canters through hundreds of years of history, reviews the current picture and offers helpful suggestions for the future of students’ unions to strengthen their work. To summarise 930 years of student representation in one pamphlet is no mean feat. Memories came flooding back of my own students’ union journey which began in Scotland – first as a volunteer, then as an officer and finally as a manager. That journey eventually brought me to my current role as Chief Executive of QAA, an organisation that has students embedded in its governance and practice. Mike Day is the Director of NUS-USI and Internationalism at the National Union of Students (NUS) and the author of a history of the NUS since its foundation in 1922 (Regal Press, 2012). He regularly contributes articles and runs sessions on the history of the student movement in the UK and internationally. He writes here in a personal capacity. Jim Dickinson is Editor of changesu.org, a website for senior managers in students’ unions. He has had a career in students’ unions, most as the Chief of Staff at the University of East Anglia Students’ Union, where he provided strategic leadership and direction for charitable and commercial activities. Jim was previously a Director at the National Union of Students, where he led on Students’ Union Development, Campaigns and Political Strategy and Student Engagement and Governance. HEPI was established in 2002 to influence the higher education debate with evidence. We are UK-wide, independent and non-partisan. We are funded by organisations and universities that wish to see a vibrant higher education debate, as well as through our own events. HEPI is a company limited by guarantee and a registered charity. Excellent. Really looking forward to reading this! The only assertion in this summary I’d contest is that there is a dearth of research on the topic. Indeed we carried out many dozens of research projects with students’ unions, many of which have been focused precisely on understanding the impact of SU’s, their structure/form, and the relationship with academic and non-academic outcomes. The issue of friendship(s) (or ‘sense of community’ as we tend to discuss it) is a vital one, and has rightly become a key strategic focus for many of our clients on the basis of the evidence we’ve gathered.